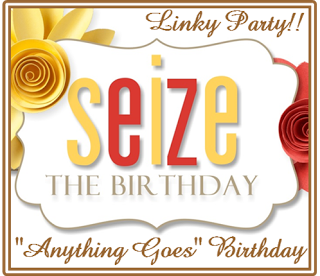 Procraftination: Seize The Birthday - Sweet Day! Seize The Birthday - Sweet Day! Yes, it's already time for a new challenge at the Seize The Birthday challenge blog! For this 2 week challenge there is NO Toppings Option. Anything goes...as long as it's a birthday card! I've been seeing some amazing creations by Birgit recently on Pinterest and was inspired by her work with inks and/or watercolors. HERE is a link to her blog. And a link HERE to her cards on Pinterest. I had SO much fun playing with distress inks and water to create this card. Loved it! The leaf was die cut from 140 lb water color paper. I smooshed ink onto my craft sheet, then misted it, generously, with water. I placed my leaf onto the wet inks and moved it around a bit. Then...the scary part. I lifted it and turned it over to see how it looked. Success! I dabbed a bit of darker ink around the edges of the leaf. Once the leaf was dry, I stamped the veins and used the tip of the brush to add more ink to them. I finished the leaf with a coat of Glossy Accents, letting it dry overnight before adhering the die cut leaf to my water colored card panel. Thanks for stopping by! Now it's time to check the inspiration from the rest of the Design Team at Seize The Birthday. Just click on the link! Adding the gloss to the leaf was a stellar move! It just gives it that extra something special. Lovely! Loved reading the process of your leaf...it came out great and so did the card! Well done Susie! Really gorgeous leaf, Susie! What a wonderful feeling when you turn it over and find such beauty, right? I went to add you to my google circle, and I saw that you work at Seymour of Sycamore … do you live there too?! That’s my hometown! I grew up on High St, the brown house right next to the gas station, which is on the south side of State St a few blocks from where you work. We were just there today visiting my mom. We’re going back in 2 weeks for Pumpkin Fest … never miss it. Such a small world, right?! that takes a lot of patience sister! gorgeous effect! Seize The Birthday Challenge - Washi tape!